If you’re a guy in the gym working with weights, not only are you probably trying to lose some fat, but also gain some muscle. This article discusses the mechanisms of how muscles grow, plus why most women won’t gain large amounts of muscle when working with weights. 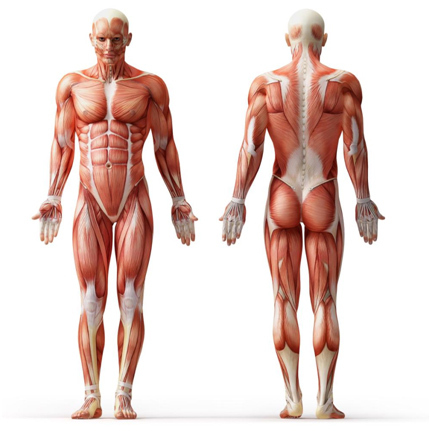 Although there are different types of muscles, such as cardiac muscle (your heart), for our concerns, we will talk exclusively about skeletal muscles. Skeletal muscle is composed of thread-like myofibrils and sarcomeres that form a muscle fiber and are the basic units of contraction. The 650 skeletal muscles in the human body contract when they receive signals from motor neurons, which are triggered from a part of the cell called the sarcoplasmic reticulum. Motor neurons tell your muscles to contract and the better you become at having those signals tell your muscles to contract, the stronger you can get. When someone like a powerlifter is able to lift very heavy weight despite not looking very muscular, it’s due to their ability to activate those motor neurons and contract their muscles better. This is why some powerlifters can be relatively smaller compared to bodybuilders, but can lift significantly more weight. Motor Unit recruitment also helps to explain why, after practice, certain movements become easier to perform and most of the initial strength gains will be when you first start to lift weights. Muscle growth tends to occur more steadily after this initial period of strength gain because you are more easily able to activate the muscles. After you workout, your body repairs or replaces damaged muscle fibers through a cellular process where it fuses muscle fibers together to form new muscle protein strands or myofibrils. These repaired myofibrils increase in thickness and number to create muscle hypertrophy (growth).1 Muscle growth occurs whenever the rate of muscle protein synthesis is greater than the rate of muscle protein breakdown. This adaption, however, does not happen while you actually lift the weights. Instead, it occurs while you rest. In one of the most interesting studies in the past 5 years, researchers showed that those who were “extreme responders” to muscle growth, with an incredible 58% myofiber hypertrophy from an exercise, had 23% activation of their satellite cells. Modest responders, who had a 28% growth, had 19% activation of their satellite cells. What is interesting to note, though, is that some people known as “non-responders” in the study had 0% growth and had a concurrent 0% activation of their satellite cells. Therefore, it seems the more you can activate these satellite cells, the more you’ll be able to grow. So then the question becomes, how do you activate these satellite cells to increase muscle growth? So now that you know the three main mechanisms of muscle growth, the next question is: how do hormones affect muscle growth? Testosterone is the main hormone that most people think about when working out with weights, and there seems to be some validity to the thought that testosterone increases protein synthesis, inhibits protein breakdown, activates satellite cells, and stimulates other anabolic hormones. Although most testosterone is bound in the body and therefore not available to use (up to 98%), strength training seems to help not only release more testosterone, but also make the receptors of your muscle cells more sensitive to your free testosterone. Testosterone can also stimulate growth hormone responses by increasing the presence of neurotransmitters at the damaged fiber site, which can help to activate tissue growth. The IGF regulates the amount of muscle mass growth by enhancing protein synthesis, facilitating glucose uptake, repartitioning the uptake of amino acids (the building blocks of protein) into skeletal muscles and once again, activates satellite cells to increase muscle growth. If you do not provide your body with adequate rest or nutrition, you can actually reverse the anabolic process and put your body into a catabolic or destructive state. The response of muscle protein metabolism to a resistance exercise bout lasts for 24-48 hours; thus, the interaction between protein metabolism and any meals consumed in this period will determine the impact of the diet on muscle hypertrophy.5 Keep in mind there is a certain limit on how much your muscles can actually grow dependent on gender, age, and genetics. For instance, men have more testosterone than women, which allows them to build bigger and stronger muscles. Muscle hypertrophy takes time and is relatively slow for the majority of people. People will generally not see visible growth for several weeks or months as most initial changes are due to the ability of your nervous system to activate your muscles. In addition to that, different people have different genetics, which range from hormonal output, muscle fiber type and number, along with satellite cell activation, that can all limit muscle growth. To ensure you’re doing your best to grow muscle, muscle protein synthesis must exceed muscle protein breakdown. This requires that you take in an adequate source of protein (especially essential amino acids) and carbohydrates to help facilitate the cellular process of rebuilding broken down muscle tissue. Visible muscle growth and evident physical changes in your body’s muscle structure can be highly motivational which is why understanding the science behind how muscles actually grow is important. For muscle breakdown and growth to occur you must force your muscles to adapt by creating stress that is different than the previous threshold your body has already adapted to. This is can be done by lifting heavier weights, continually changing your exercises so that you can damage more total muscle fibers and pushing your muscles to fatigue while getting a “pump.” After the workout is completed, the most important part begins which is adequate rest and providing ample fuel to your muscles so they can regenerate and grow.